This weekend, I was glistening up a storm (I was actually sweating buckets in the 90 degree heat but glistening sounds better) so in my book, it’s officially summer even though we have a couple of more weeks until it’s official. 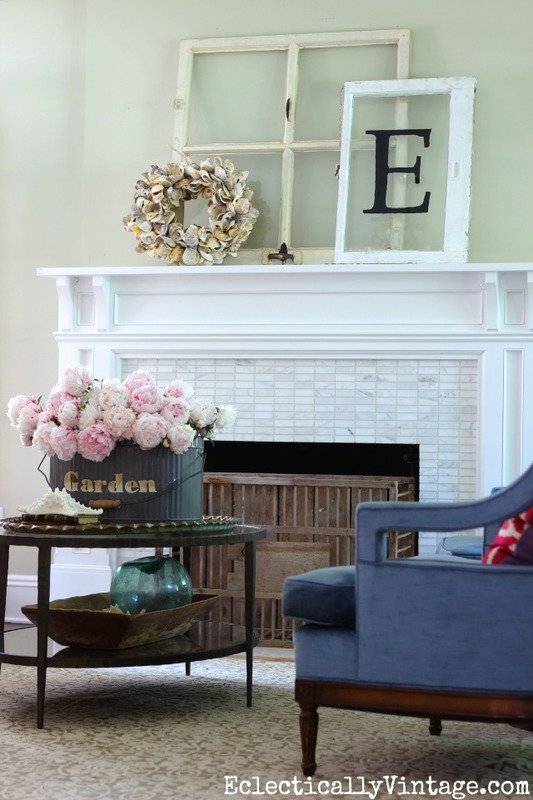 I’m kicking off a week of summer home tours that my friend Lindsay put together and you can start the tour on her blog then hop from house to house for some summer decorating eye candy all week long – see the full list of home tours at the end of my post. 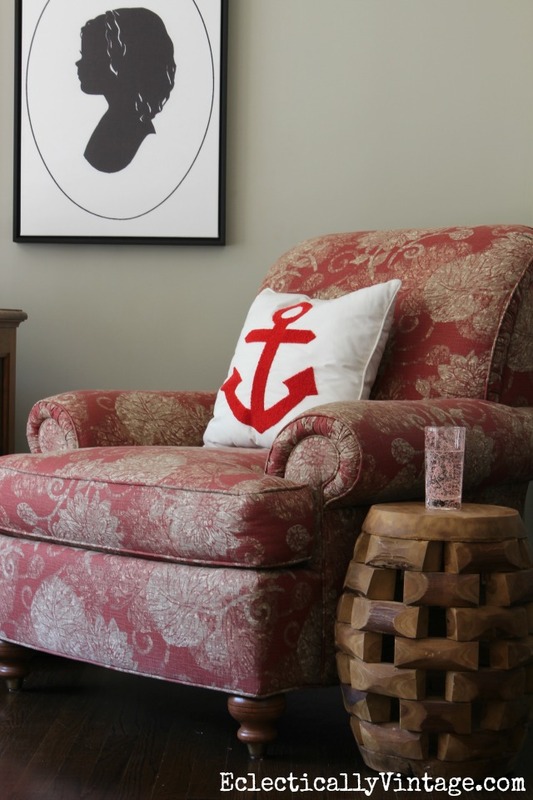 Don’t miss the home tour before mine –Bliss at Home. My peonies did not disappoint and my three bushes yielded tons of gorgeous blooms! 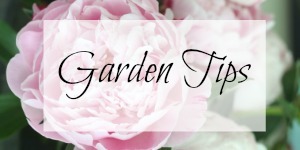 Don’t miss my post on How to Grow Peonies. 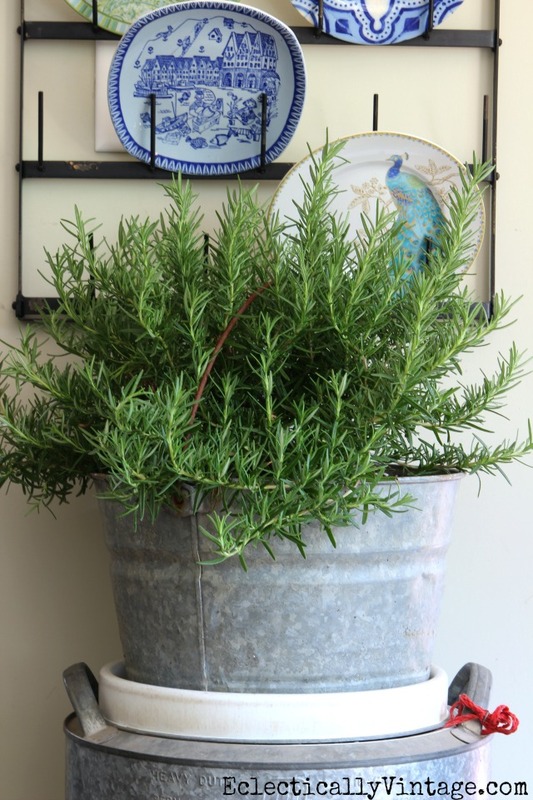 I found two amazing vintage galvanized water coolers at an estate sale a couple of weeks ago and they’re the perfect vases for my peonies and rosemary. 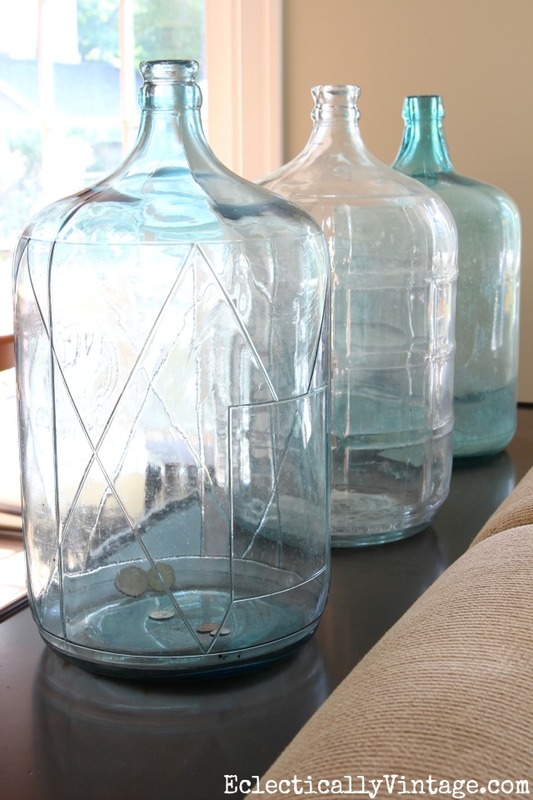 I love mixing up the displays on my huge glass drying rack – from mason jars to hanging vases filled with flowers to my favorite plate collections, it’s always something different. 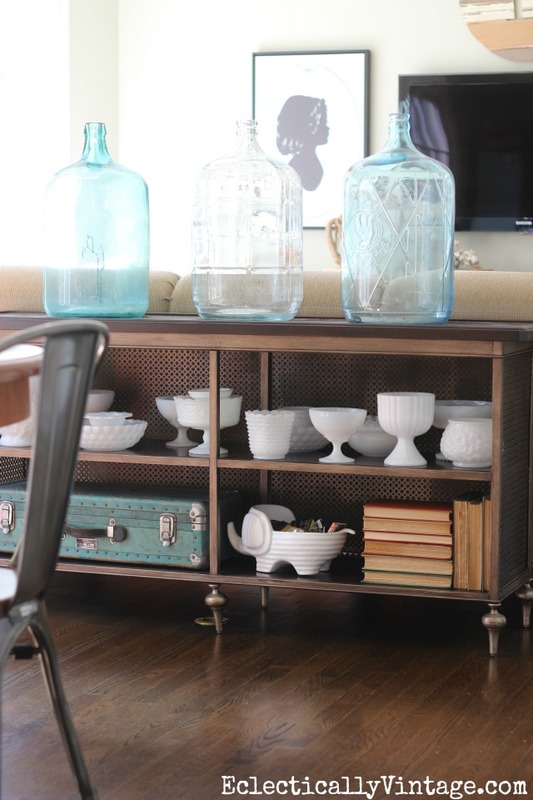 A console table separates my kitchen from my family room and it’s the perfect place to display some of my many collections – vintage milk glass and glass water bottles. 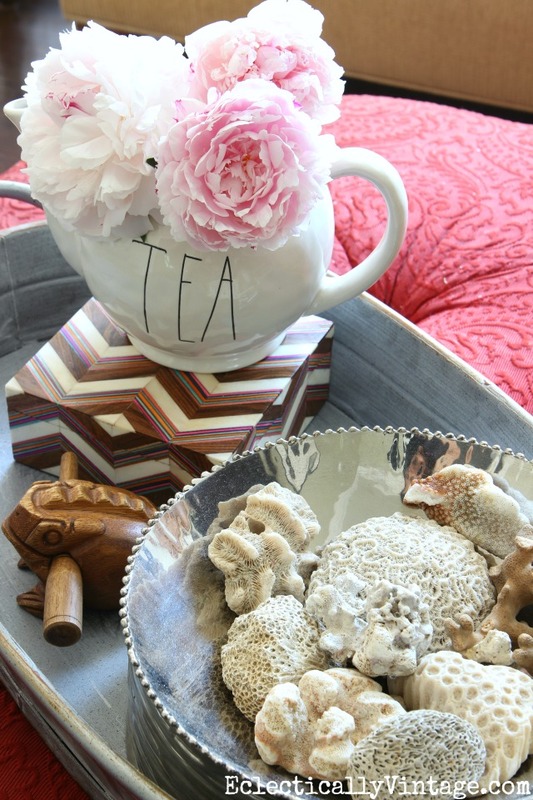 I’ve found the most amazing pieces of coral at estate sales and love displaying them in a shiny silver bowl. 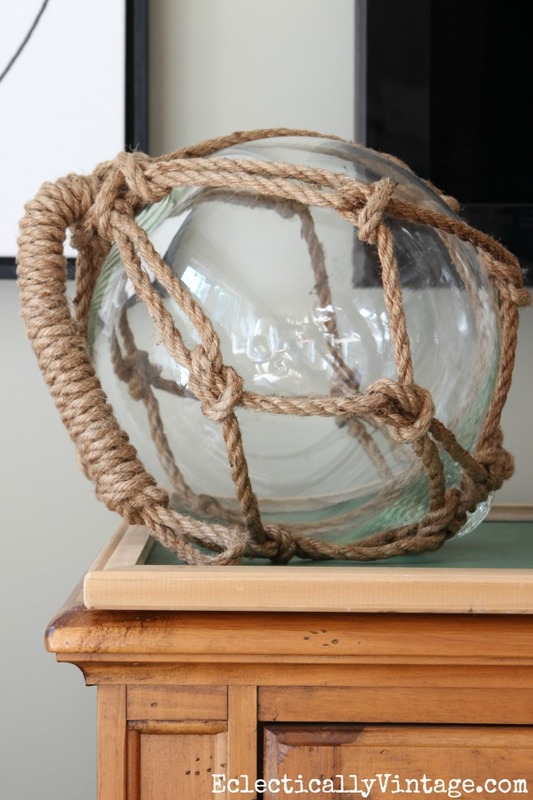 I love glass mixed with lots of texture from a rope monkey ball and a bunch of old folding rulers. With flowers that only bloom for a fleeting time, I make sure they fill my entire house with their amazing scent. 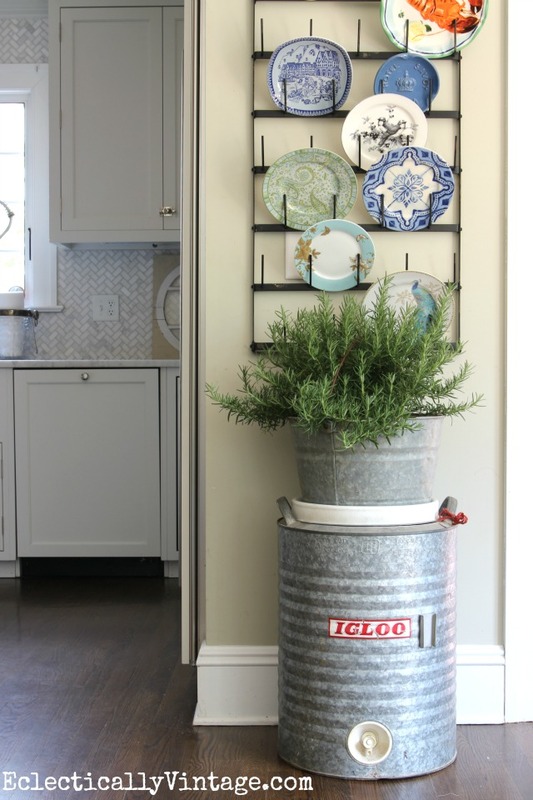 I love using unique containers like this metal garden tote and the bigger the better for a real wow! 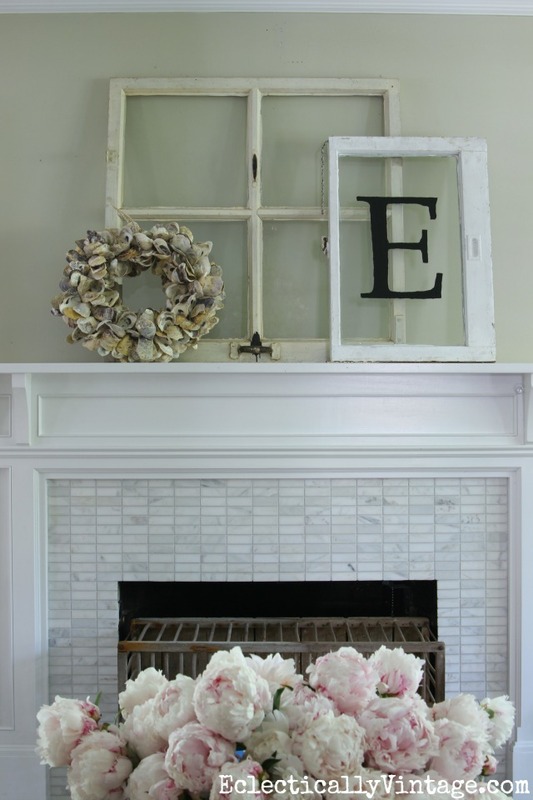 The oyster wreath is from HomeGoods and it’s easy to prop it on the mantel for a casual look. 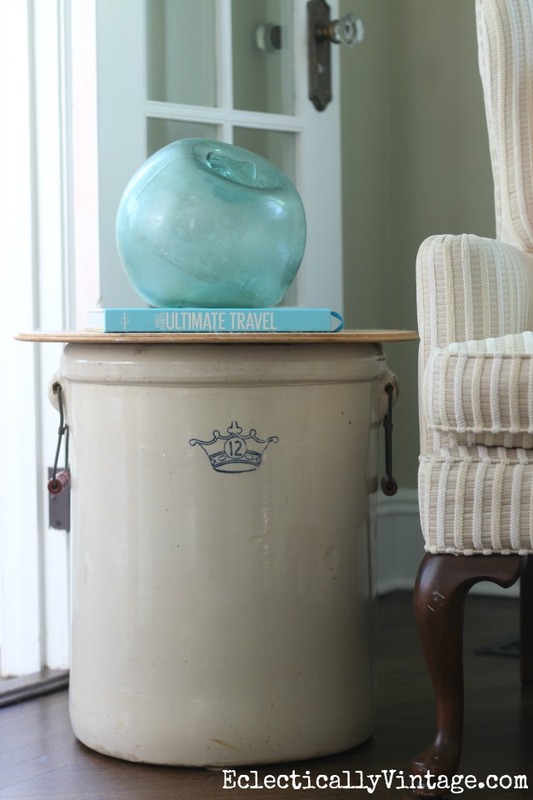 An old crock gets a second life as a side table. My old house has a tiny entrance vestibule that separates the front door from the foyer. 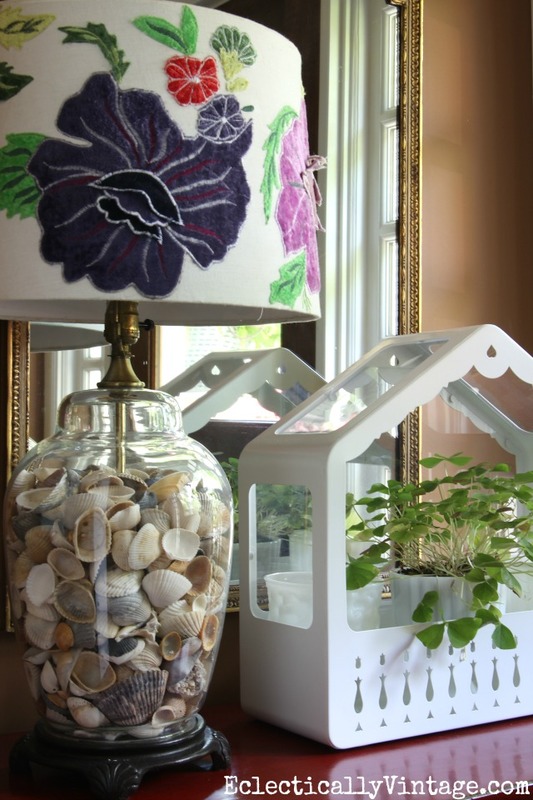 Guests are greeted by a shell filled lamp and a cute little house terrarium that scream summer. A picnic basket is always at the ready for summer get togethers. The patio is my favorite summer room. 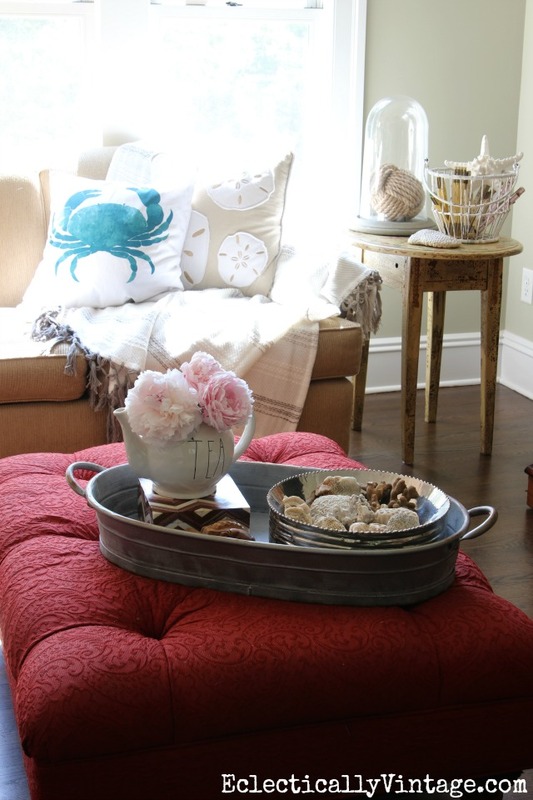 I recently redid the space and love the huge concrete topped coffee table and sectional sofa perfect for lounging. 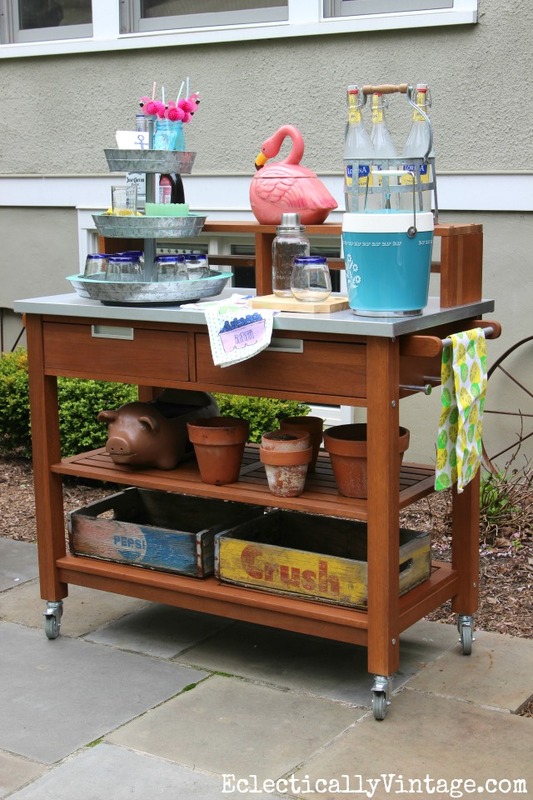 This potting stand makes outdoor entertaining a breeze. You can see my full patio tour here. Who’s ready for a margarita on the patio? 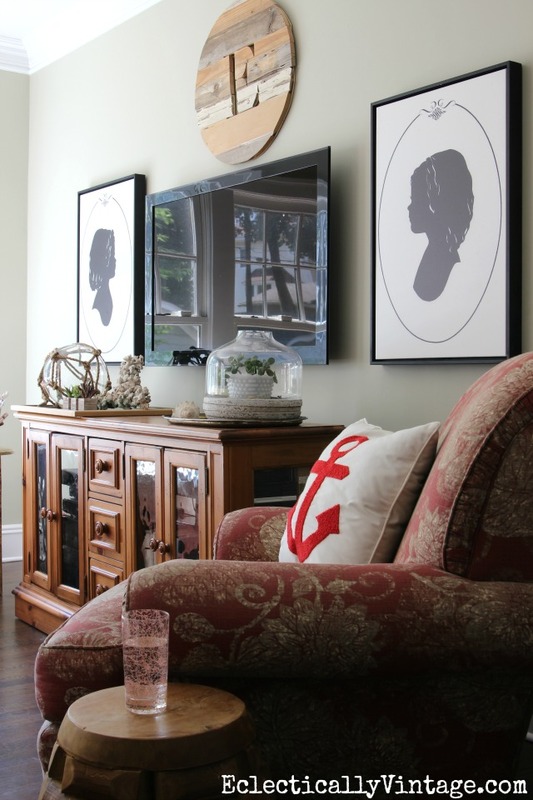 See my last year’s summer home tour for more decorating ideas. Next stop on the summer home tour bus is Jennifer from Dimples and Tangles. Oh peonies, why can’t you last longer?! Oh my gosh I was proud of me peonies but yours are insane. Everything is so so pretty! My peonies were incredible this year – sad they only last such a s short time! Happy summer Julia! Just wonderful! 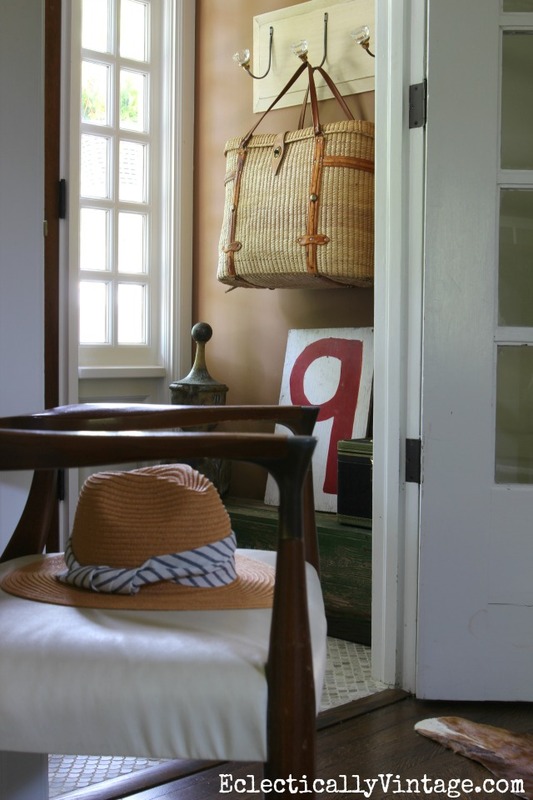 All of the vintage you pieces really make everything so much more fun and personable. Great job! 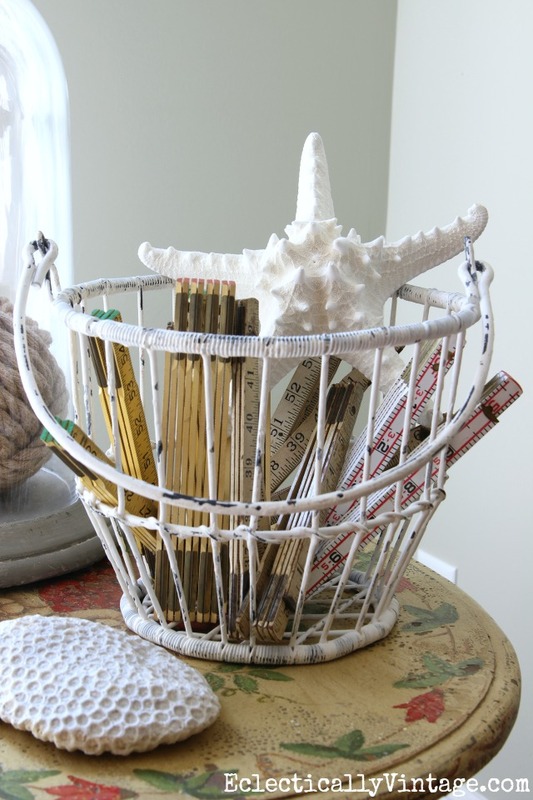 Thank you Stacey – old finds are definitely more fun! Everything looks great, Kelly! 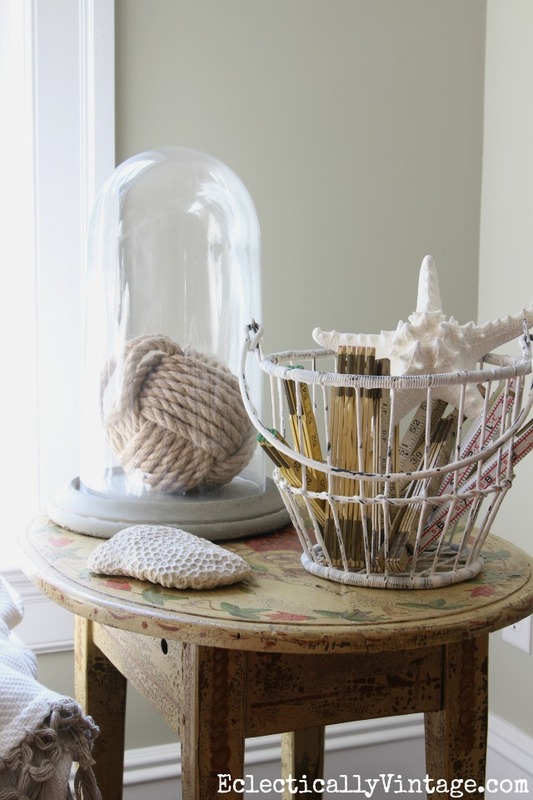 I love the beachy accents and your milk glass. 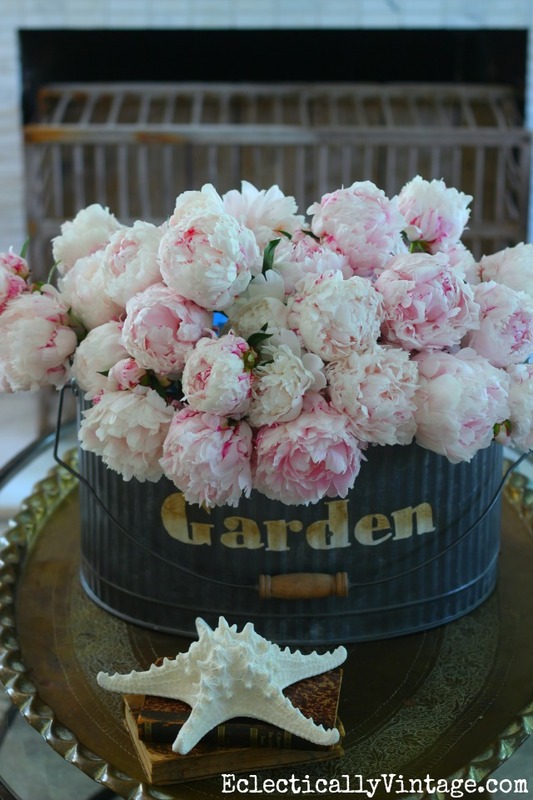 And those peonies…they’re gorgeous! Thanks Angie and happy summer! Looks like you have peony envy! Thanks Heidi – happy summer! We have the little frog you have! It’s in the toy basket for our grands but bringing it out to put on a tray now I see yours. Isn’t he the cutest! Glad you gave him a place of honor! That PICNIC BASKET hanging on the hook!! I die!! I collect them but have never seen one like that!! ??? Isn’t it fun Susan – I got it at an estate sale! It seems like just “yesterday,” I was drooling over your Christmas tour … and now I’m loving your Summer tour! (This year is flying by.) Everything looks awesome … so fresh and welcoming of the warmer temps! 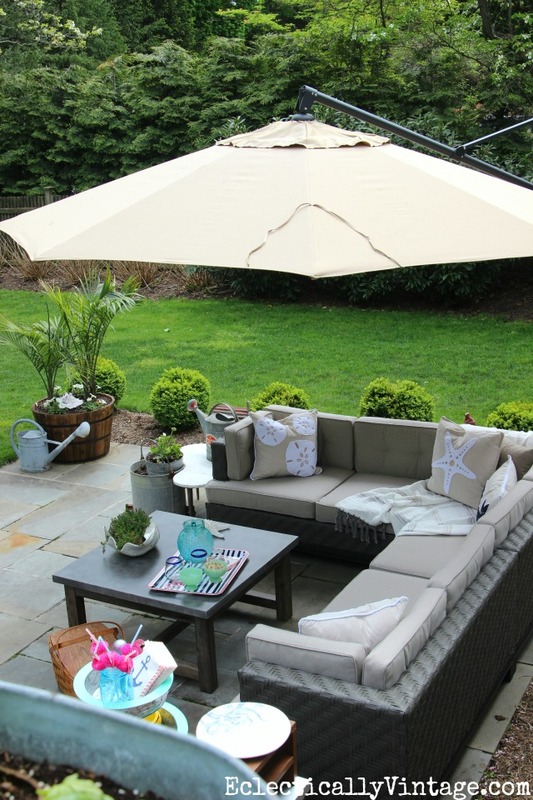 And, I love your outdoor space … gorgeous! What time is happy hour? 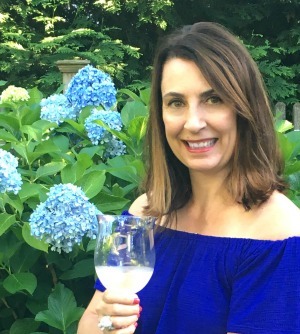 24 hour a day happy hour here – come on over Becca! Kelly, those peonies are GORGEOUS!! 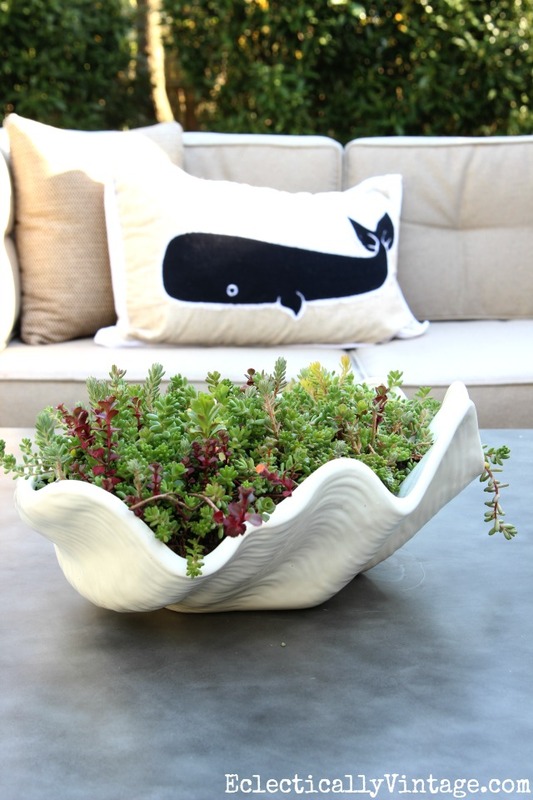 What a treasure to grow those in your yard! You’re home is so lovely! Great tour! 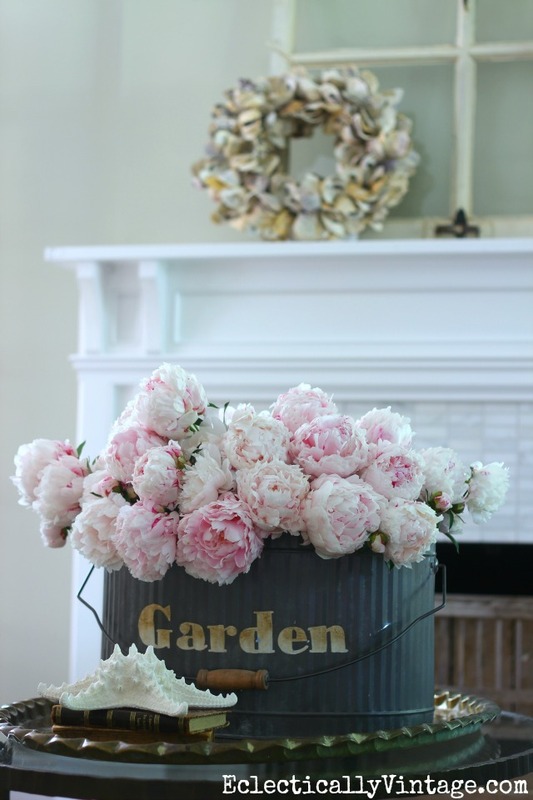 Thanks so much Shauna – I planted 3 peony bushes last spring and they are amazing! My eye went right to the white elephant on your bookshelf! Let me know when you are done with him! I’ll take him off of your hands! So cute! Isn’t he cute Dawn – I found him at HomeGoods! 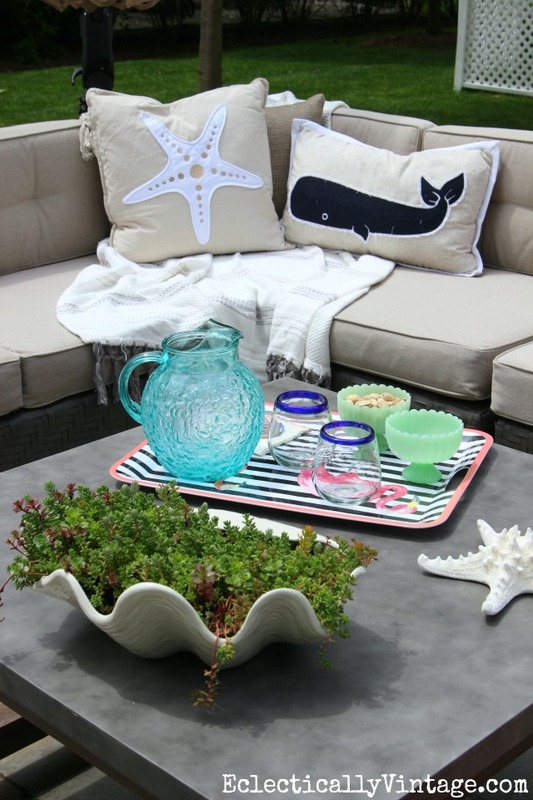 You have an impressive collection of milk glass and those water jugs are awesome! 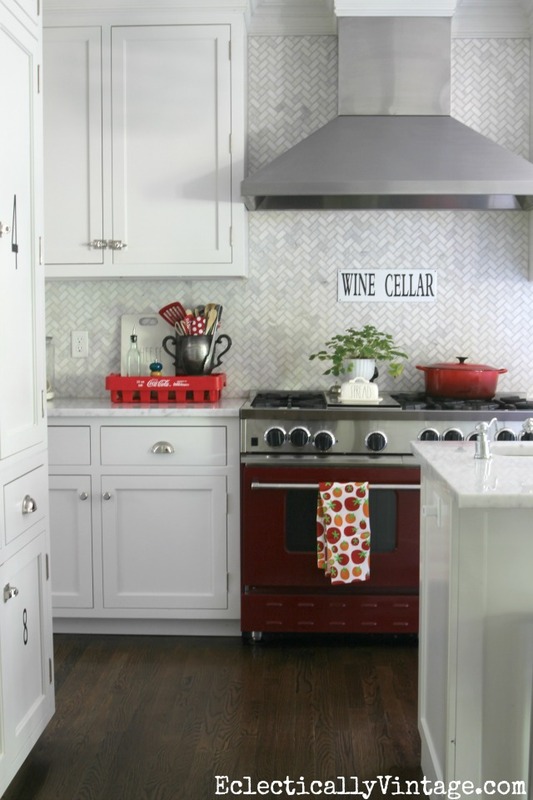 Your pendant lights in the kitchen made my heart pitter patter. Lovely! I love your home there is so many neat things to see. Thanks for giving the tour. 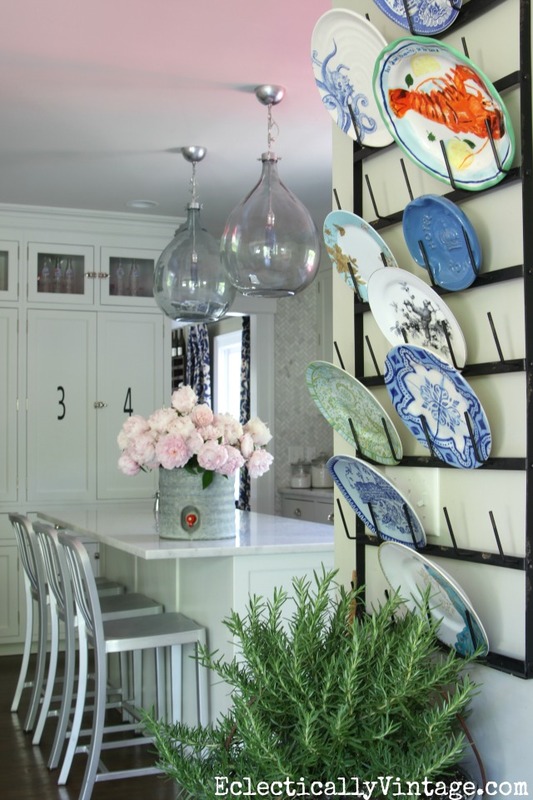 The peonies are beautiful, and I love the plate rack in the kitchen! Gorgeous home! I just found your blog and am so glad I did! I love your house and all the decor. You have inspired me to make a few changes of my own. Thanks for the inspiration, can’t wait to see what’s next! Patio perfection. 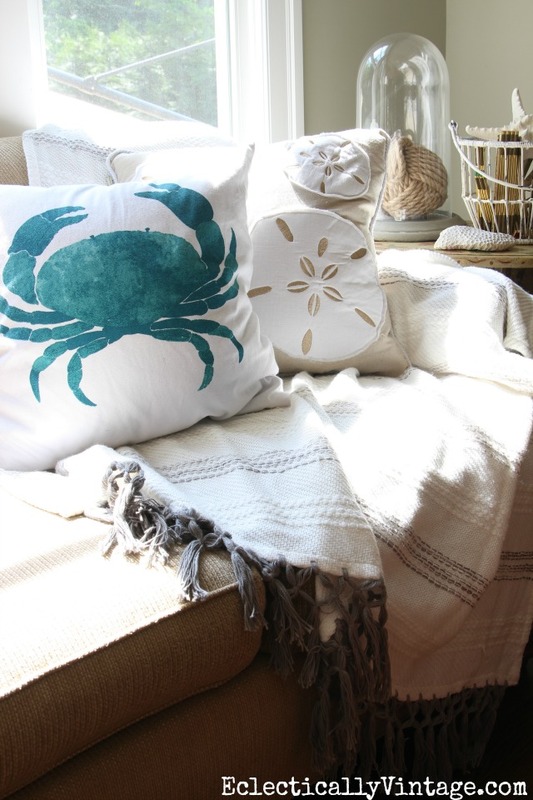 Love all your summer pillows. So much vintage goodness! 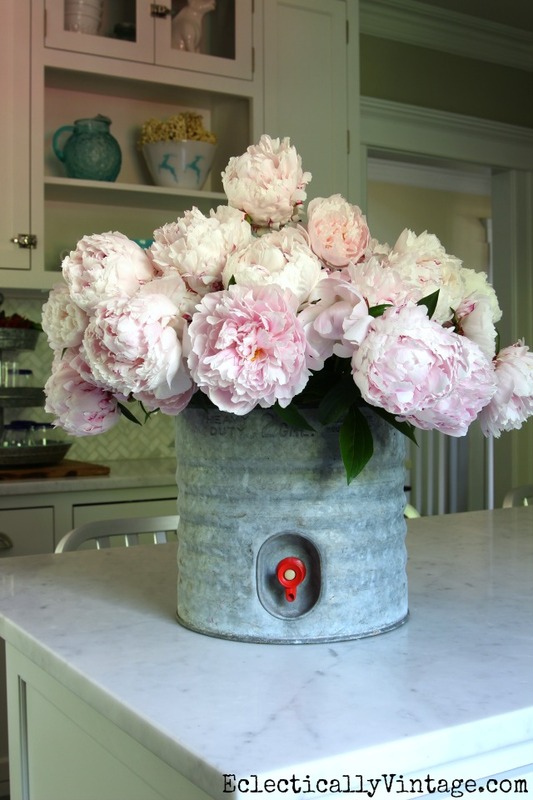 Love that water cooler and your peonies are INSANE!!! I have one little bush just starting out and you have given me serious Peony goals!! 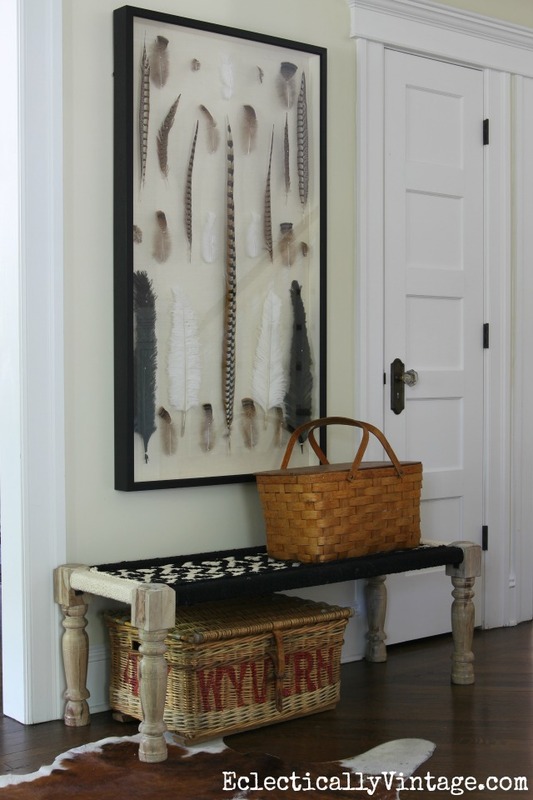 Love the way you manage to have a lot of pieces on display but somehow it doesn’t feel like clutter. Looks lovely. 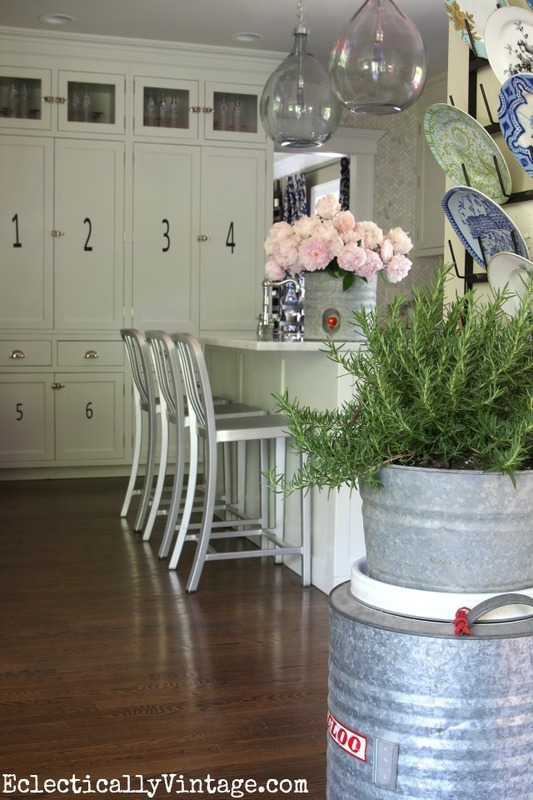 Everyone seems to copy one another with the new Farmhouse style. You are your own person and I love it. Maybe because I am very much the same.